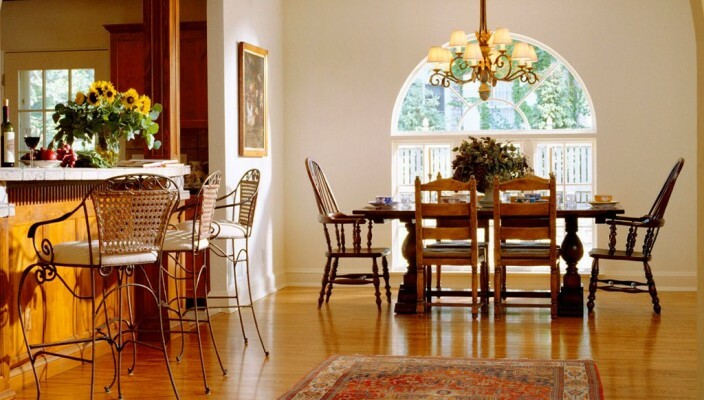 A dining room design has to be vibrant, colorful and yet somber. The dining area should be decorated in such a manner that the appetite of the user should increase ten folds just by feasting his eyes on the beauty of the vicinity. The room should be a tasteful palette of colors, textures and light. The wooden polished floor should accent the furniture. Highly polished and intricately designed dining table goes well with the mood of the room. The light entering the room should neither be too much nor too less. It should be regulated to make it compatible with the lightly shaded walls. A clash of modern and Victorian décor gives a rich feel to the room. A meticulously designed chandelier right above the dining table will complement the beauty of the room in the evening and at night. The carpet used should not be vibrantly colored as it will ruin the effect of polished wooden floor. Anything simple and elegant with dark colors should do the trick.